For a trial version user, please get a password hint using the feature Password Prompt. 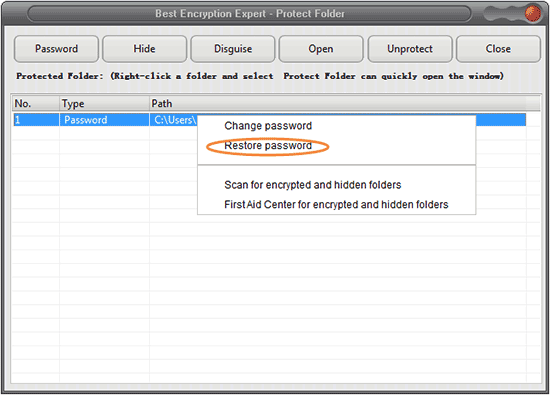 Start Best Encryption Expert, click the Protect Folder button, select the protection record that you forget its password, then click the Unprotect. Enter the correct password hint command and click OK. It will prompt you the 1st character if your password length is between 3 to 5 characters; and the first and the last characters for over 6 characters (include 6). 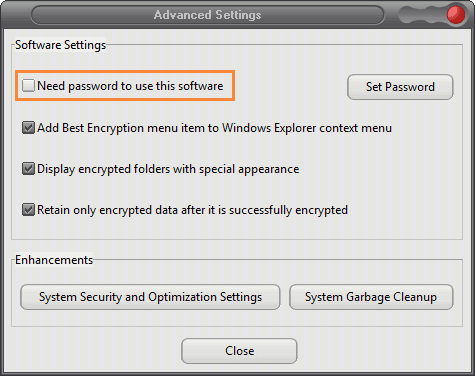 The password hint command is changed due to the different software version. Please contact us with your software version and we will offer you the password hint command. For a full version user, you can retrieve your password with the Restore Password feature. 2. Click the Protect Folder button, and right click on the protection record that you forget its password. Select Restore Password from the dropdown menu, then enter your admin password and click OK. The program will tell you what the password you set for the folder. Previous: How to remove disguise from a folder without disguise record? Next: What if I forget the password of Full- , Diamond- , and Portable-encrypted folders? What if I forget the password of an encrypted file? It prompts "Encrypted data is not found" when I open/unprotect a Password-protected folder or I cannot find the Hiding-protected folder in the software. What should I do? Error Codes prompted at the time of encryption and decryption? I am prompted "Error code 0: failed to read encrypted data" when unprotecting a password-protected folder? What if an encrypted file or folder cannot be opened after decryption?